A “chilling” (O, The Oprah Magazine), “darkly brilliant” (Bookforum) account of “the effects of war on the psyches of the soldiers who fight” (Esquire). In 2005 a Chinook helicopter carrying sixteen Special Ops soldiers crashed during a rescue mission in Afghanistan, killing everyone on board. In that instant, machine gunner Caleb Daniels lost his best friend, Kip, and seven members of his unit. Back in the US, Caleb begins to see them everywhere—dead Kip, with his Alice in Wonderland tattoos, and the rest of them, their burned bodies always watching him. But there is something else haunting Caleb, too—a presence he calls the Black Thing, or the Destroyer, a paralyzing horror that Caleb comes to believe is a demon. Alone with these apparitions, Caleb considers killing himself. There is an epidemic of suicide among veterans of Iraq and Afghanistan, men and women with post-traumatic stress disorder who cannot cope with ordinary life in the aftermath of explosions and carnage. Author Jen Percy finds herself drawn to their stories. Her main subject, Caleb, has been bringing damaged veterans to a Christian exorcism camp in Georgia that promises them deliverance from the war. As Percy spends time with these soldiers and exorcists—finding their beliefs both repellant and magnetic—she enters a world of fanaticism that is alternately terrifying and welcoming. Jen Percy is a graduate of the Iowa Writers’ Workshop, where she received a Truman Capote Fellowship in fiction. She also received an Iowa Arts Fellowship from Iowa’s Nonfiction Writing Program. Winner of a Pushcart Prize and a grant from the National Endowment for the Arts, her work has appeared in a number of magazines, including Harper’s, The New Republic, and The Oxford American. She teaches writing at New York University. "Shines a bright light on America's wounded psyche. . . . Percy's beautiful, lucid writing takes the reader into the lives of soldiers wrestling with faith in this often harrowing book on the personal, cultural, and political costs of war." "The most unusual and beautiful portrait of trauma to come out of the last thirteen years." "Thrilling . . . Percy is on to something essential here: understanding PTSD is one key to understanding our present cultural moment." "Harrowing . . . An unpredictable and gripping story." 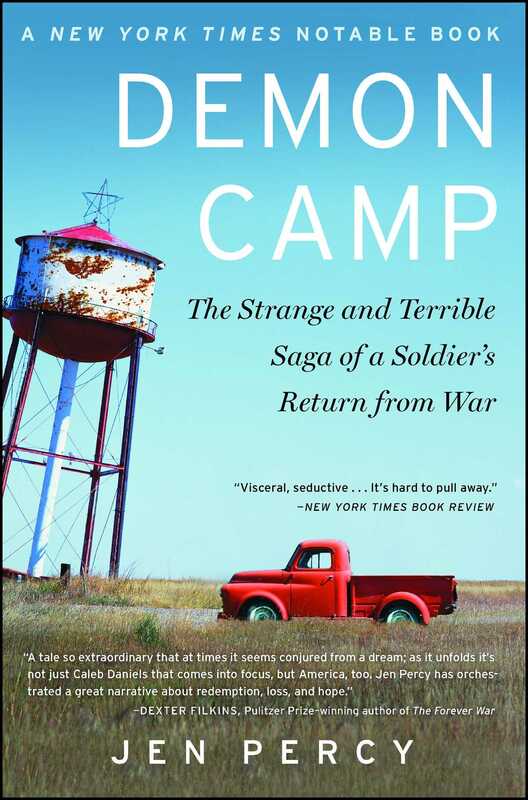 "Demon Camp is the most urgent, most harrowing book to yet emerge from our wars in Iraq and Afghanistan. Jennifer Percy is a brave and relentlessly powerful witness, again and again confronting us with the monsters of our own making. Written with haunting austerity, this exceptionally important book must be read not only by every voter but by every one of us yearning to be more humane." "This wild journey alongside madness leads Percy to the place where myth is conceived and destroyed, our wars overseas brought home as nightmares. You will begin to wonder how much pain is dreamed and if fantasy might be the way to cure it. A unique, fascinating and always surprising book." "A disconcertingly intimate book . . . Beautifully creepy . . ."
"With exquisite patience, a wide open mind, and a willingness that trembles on vulnerability to immerse herself in her subject, Jennifer Percy recounts the terrible, ongoing struggles of soldiers whom the war has followed home. Writing in lucid, beautiful sentences, Percy exposes the great psychic cost of the Bush-era wars as paid by these young men, and gives us to understand that their stories are America’s stories, their demons, America’s demons." "Demon Camp is for fans of Michael Herr's Dispatches or Hunter Thompson's own dark journeys through America; indeed, it's hard to describe Demon Camp as anything but a tour de force literary experience: exquisitely written, psychologically deft and nimble, and shocking. Jen Percy writes a book that is at once so singular that it speaks to despair and joy yawing over our collective horizon. Here is a new, utterly surprising world we can scarcely imagine being in, except in Percy's hands." "If you want to understand America now, read Jennifer Percy's Demon Camp. An electric, unflinchingly brave and entirely necessary debut." "Jennifer Percy has walked far out into The Twilight Zone and leads us into realms of horror and dread, mystery and high weirdness. I have never read anything quite like it. Are there devils? You might come away from this book thinking it's possible." "You can't walk away from Percy's strong debut without feeling like you've spent a frightening moment inside the heads of soldiers who come home from war with nothing but demons, no place to go and no easy role to play. . . . An auspicious debut." "[A] talented young writer... Chilling and raw."